Transverse stability is first defined and practical application formulas are presented. The includes the effects of weights and moments on one side. The effects of displaced volume properties on the other side. Concepts like metacentric height are utilized. Then the effects of weight distribution and vessel hydrostatic response in the longitudinal direction are then described and trim formulas are derived and presented for application. Someone with a basic algebra background should be able to understand and benefit from these articles. 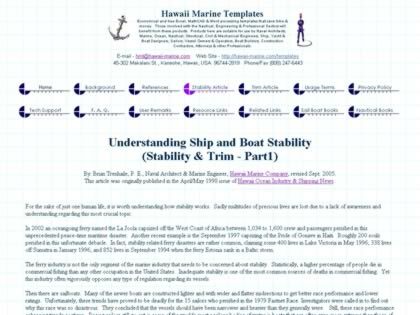 Web Site Snapshot: If available, above is a snapshot of the Transverse Stability and Longitudinal Trim Articles web site at http://hawaii-marine.com/templates/stability_article.htm as it appeared when this site was added to the directory or last verified. Please Note that Boat Design Net has no involvement with the above web site; all content and images depicted in the above thumbnail are the property and copyright of Transverse Stability and Longitudinal Trim Articles unless otherwise noted on that site. Description: Transverse stability is first defined and practical application formulas are presented. The includes the effects of weights and moments on one side. The effects of displaced volume properties on the other side. Concepts like metacentric height are utilized. Then the effects of weight distribution and vessel hydrostatic response in the longitudinal direction are then described and trim formulas are derived and presented for application. Someone with a basic algebra background should be able to understand and benefit from these articles.